Dendritic cell. 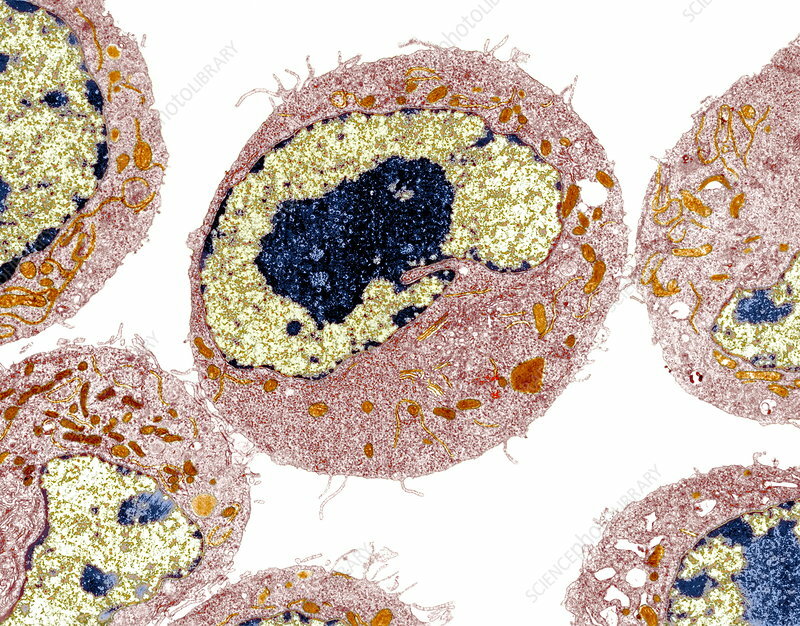 Coloured transmission electron micrograph (TEM) of a section through dendritic cells. These are part of the human immune system. The nuclei (blue) are seen, surrounded by the cell cytoplasm (pink). Dendritic cells are macrophage cells that are found in the body's tissues. These ones are found in the skin and are also known as histiocytes or Langerhans cells. Long projections on the cell surfaces (not clearly seen) help them to move. The cells recognise and engulf foreign cells in a process that is called phagocytosis. Magnification: x12,000 when printed 10cm wide.